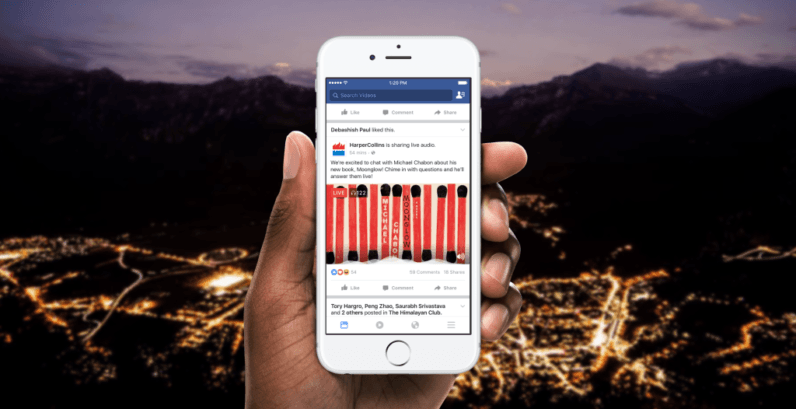 While last week Facebook built on Live’s video chops with the introduction of 360-degree video, this time around it’s paring down on the tech a bit with something a bit more old school: live audio. Relive the glory days of live radio! In all seriousness, there are plenty of situations where audio-only streams are welcome or even preferable. Plenty of people listen in on podcasts, after all; it’s not hard to imagine podcasters and authors using live audio to engage with their audiences. It’s useful for interviews where video may be superfluous, and as it negates the need to hold up your phone or set up a tripod, it might encourage people to go live more often. It’ll particularly come in handy for broadcasters in areas with low signal, as audio takes up much less bandwidth than video. On a more somber note, we’ve seen Facebook Live used to document dangerous interactions; where video isn’t necessary, Live audio could serve as a way to quickly broadcast a call for help. On the other hand, this also makes me wish Facebook would enable and audio-only mode for streams which already include video. I often don’t need to see what’s happening in the actual video, as I am only concerned with what the streamers are saying. Not to mention that with Live audio, you’re able to keep sound going even as you leave the app or lock your phone if you’re on Android (iOS so long as you’re within the app). You can’t do that with video streams. As with Live 360, live audio is only rolling out to a select few partners to start, including BBC World Service, LBC, Harper Collins, and authors Adam Grant and Britt Bennett. It will become available to everyone else early next year. Anyway, now I’m just waiting for Morgan Freeman to set up a daily livestream of himself saying things, when he’s not apparently too busy being Jarvis for Mark Zuckerberg’s house that is.